Game Three of the ALDS will begin at 6:08pm today, 26 hours after it was originally scheduled to be played. The rain that drenched Boston might have given the Red Sox a little extra support towards chipping away at their 0-2 series deficit. Both teams will proceed as initially planned in terms of starting pitchers, but the issue that might arise for the Indians if the Red Sox can hold off elimination for just one day, is the use of their bullpen. After shutting down the Sox bats in Game One and barely being used in Game Two, they appear to be ready to carry the load today if needed. However, with a Sox victory, it might lead to some tough decisions by Terry Francona on who should be used on back to back days. Before all of Red Sox Nation can get to that point though, they'll be hoping Clay Buchholz can save the season and continue his September success into October. In five postseason starts, Clay hasn't recorded a win and has an ERA of 4.21 with 20 K's and 9 BB's in 25 2/3 innings. 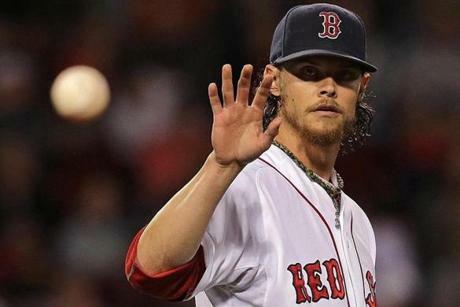 Buchholz surprised a lot of fans as the season came down to the stretch run, going 4-0 in his last seven starts of the season with a 2.63 ERA. The Indians starting lineup has 63 at-bats against Buchholz and are hitting a combined .302 average, with 4 homers and 16 RBI's. The Indians will send out Josh Tomlin as their starter and he's currently the main reason why Sox fans should be hopeful that they can extend the series another game. While he ended the season going 2-1 in his final 4 starts, he hasn't pitched well at Fenway Park in his career, going 0-2, 5.79 ERA .303 BAA and .890 OPS. As we saw in Game One, Francona won't shy away from using his top relievers for high pressure situations as early as possible. But if Tomlin can get through 5 innings today, the Tribe should be in good shape. The Sox starting lineup is only hitting .258 against Tomlin in 62 at-bats, however David Ortiz has 3 homers against him. Of course, it'll be all hands on deck for the Red Sox, which will include Eduardo Rodriguez and David Price to come out of the pen if needed today. Rick Porcello will be the Game Four starter if the Sox can pull out a win.